Node.js shines in single-thread calculations for network applications. However, Node.js doesn’t have out-of-the box solutions for parallel processing. For this, you need to install additional packages. Of course, such problems are solved with the help of packages or extensions. But in this article, I want to show how to extend the Node.js performance in these cases. Node technology was written on C++ under the hood which is very fast and powerful in development of applications for low level tasks or heavy computations. As a result, Node is C++ friendly and allows developers to run C++ code in Node.js applications. This is done with the help of Node addons. 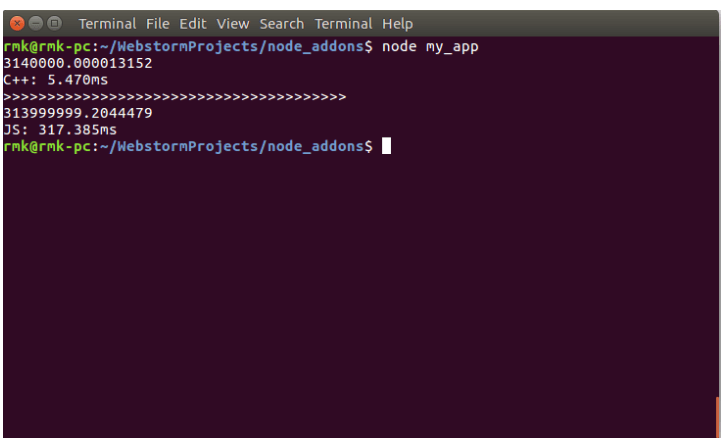 What power do Node.js addons give to us? That sounds interesting in theory, but what about practice? First of all, we will give a tribute to the traditions and develop“Hello world!” application with C++ addon . Npm is the package manager for Node. It loads and manages ready solutions such as libraries and modules. 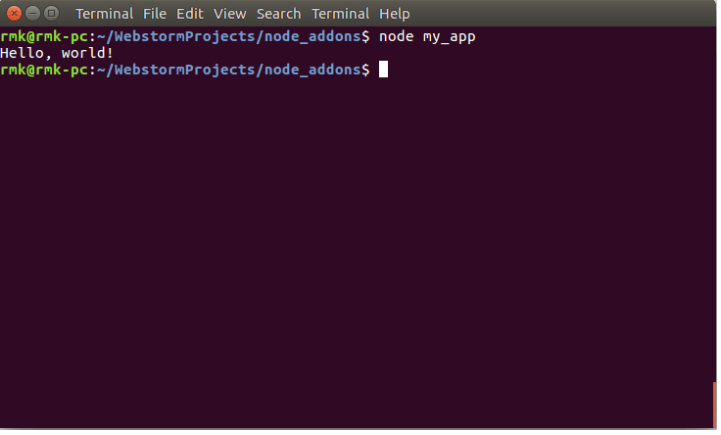 Usually, Node is installed together with Npm. Here you can find a tutorial on how to install Node with the command line for the most popular operating systems. To initialize a new Npm directory, execute the command code: npm init. You will have to answer several questions to set the project. Finally, the package.json file that contains the basic information about the project will be created in the project directory. The list of necessary packages will be also stored in this file. After you have set up the project, install the necessary packages. In this project you need only one package - “node-gyp”. It’s a tool that compiles Node.js addons. Simply speaking, node-gyp compiles C/C++ for using it with Node.js. This package is compulsory for a lot of apps, as in many cases code that should be compiled is loaded along with the package. One more peculiarity of node-gyp is that it compiles the code regardless of the operating system. This feature allows avoiding a number of mistakes related to the differences in operating systems for Node-based projects. g- flag, that indicates that the project has to be installed globally and used for any Node project on this operating system. After you have installed the package for C/C++ code compilation, configure node-gyp within the project. First, create binding.gyp file inside the project. This file will contain information about node-gyp functioning. Let&apos;s write the addon file. In the root of my project I create ‘addon.cpp’ file. We start from including modules. <node.h> is required for building some kind of interface with Node application. C/C++ languages have no built-in input/output. Instead of it, let’s use the iostream library which is included into standard C++ and contains methods to manage input / output. With the help of this code we can connect the namespaces to our file. Variables, located in the namespaces listed above are now available in our file. For example, we will use “cout” and “endl” functions from the “std” namespaces, and also “FunctionCallbackInfo”, “Value”, “Local”, “Object” from the V8 namespace. We don’t import these functions or variables. They appear in the file after namespaces connection. This part of code is easy to understand. We just describe a function “HelloWorld” which gives homonym line to standard output thread. Also this function has two parameters: callback and args array, but we don’t need them yet. This function is responsible for the HelloWorld function export. As you see, you can export the function under any name. Run compiled C++ code with using common Node Application. Just a joke. If seriously, when everything’s right, the folder build will appear in the project directory. It will contain just compiled addon code. The last step is to create a general JS file to test the compiled addon in action. Create “my_app.js” file in the root of project. It can contain 3 lines of code. First line - importing of our addon. Third line - function call. If you do everything correct you can run this file with command “node my_app”. As you can see, your app puts Hello world message into console and this action was programmed in “addon.cc” file on C++ language. We already know how to run C++ code in Node.js applications. Now it’s time to have some fun and use this skill in more engaging tasks. Let’s make some heavy computations that require high accuracy both on JS and C++ and compare the execution time in numbers. First, let’s expand the addon with one more function. With the help of args object we get two parameters that will be transmitted when calling the function. double valueToSum = args->NumberValue(); - get the value we will add in the cycle and turn it into a real number. int sumCount = args->IntegerValue(); - second parameter is the number of times the number will be summed. We turn it into a real number as well. We add the number in the cycle and save a result into the variable “result”. A similar functionality was written in Js file. Let’s check its execution time and compare it to the previous one. A function described below calls the developed logic in C++ and in JS as well, transmitting functions into the same parameters. So we will do the same task with the same input data but different tools. For our performance test we will add 3.14 number for a hundred millions times. C++ in this case works much much faster and gives us more accurate results. I have written this article not to show how bad JS is against the background of splendid C++. Each programming language was designed for certain applications it deals well with. The aim of this article is to show how you can expand your Node app with the help of C++ addons and get better productivity in custom computation-intensive applications.